Na Kau A Hi'iaka is a play based on the epic saga of Hi'iakaikapoliopele. Hawaiian playwright and director Kau'i Kaina (right) with her son Iosepa in tow, goes over some last-minute notes with her female lead Punihei Lipe, who plays Hi'iakaikapoliopele in the Hawaiian-language production Na Kau A Hi'iaka. 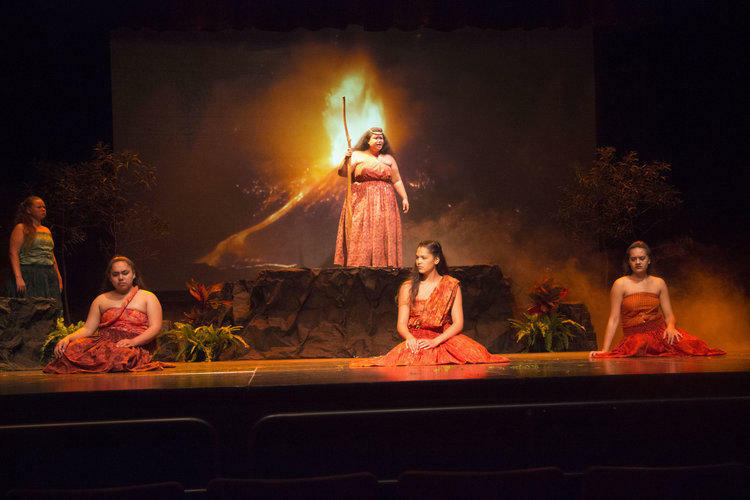 Nā Kau a Hiʻiaka is a play based on the story of a woman named Hiʻiakaikapoliopele who was sent on a journey across the island chain by her older sister Pele, the volcano goddess, to find her sister’s lover Lohiʻau and bring him back safely. “She was faced with several different obstacles, different creatures or beings that were trying to stop her but she kept persevering,” says Kaina. 35-year-old Kauʻi Kaina is the playwright and director of Nā Kau a Hiʻiaka, a Hawaiian language play based on the Hiʻiakaikapoliopele saga. In this scene, Hi'iakaikapoliopele slays a mo'o (lizard), one of many obstacles along her journey to find her sister Pele's lover and return him safely to Pele. “Through her perseverance she was able to strengthen and grow from this young innocent girl to this goddess,” says Kaina. The cast of Hi'iakaikapoliopele huddles before their first full rehearsal. Kaina spent the last three years studying the epic tale Hiʻiakaikapoliopele through hula and reading it in Hawaiian language newspapers as far back as the 1800s. The epic saga of Hi'iakaikapoliopele appeared in several Hawaiian language newspapers dating back to the 1800s. 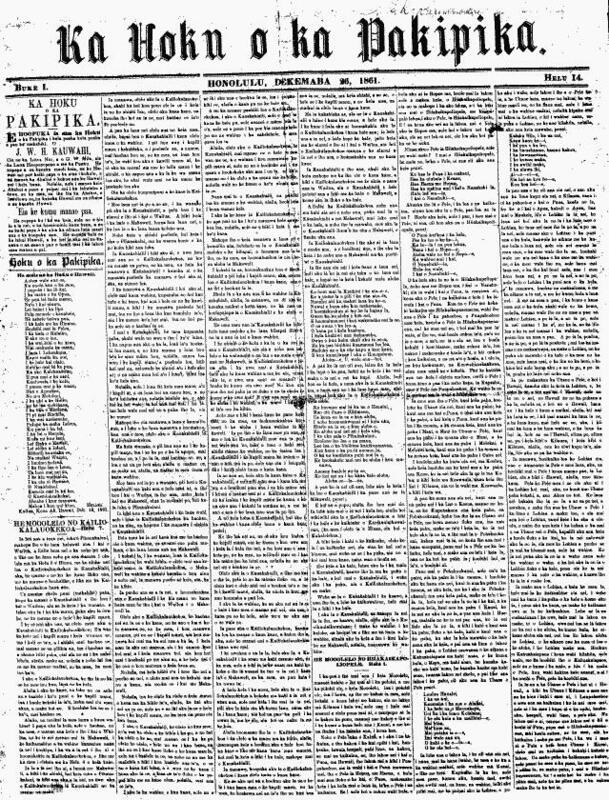 Here is the version published in the newspaper Ka Hoku O Ka Pakipika on December 26, 1861. She incorporates these elements into Nā Kau a Hiʻiaka, which serves as her master’s thesis. Kaina is the first student at the University of Hawaiʻi at Mānoa to earn a Master’s in Fine Arts degree in Hawaiian Theater, a program established in 2012. 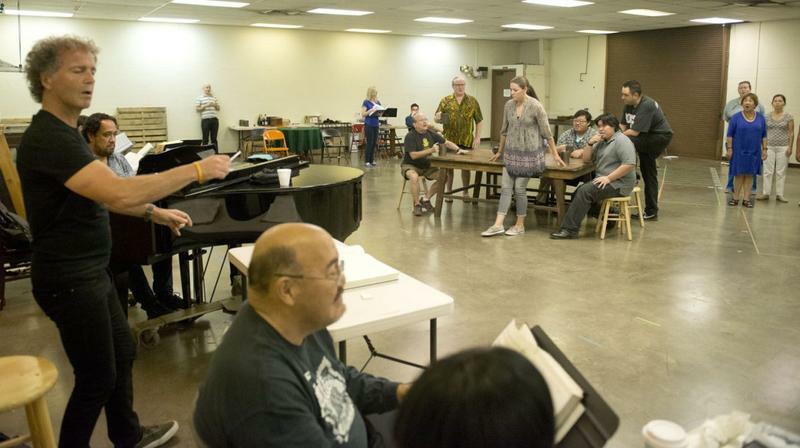 “So Hawaiian theater has, it’s kind of a mixture of the western theater world but focusing on indigenous language, indigenous culture, and even an indigenous world view, and done in a Hawaiian medium,” says Kaina. Noah Ha'alilio Solomon tries on his mahiole or feather helmet in the during rehearsal. Solomon plays Lohiau, Pele's lover, in the play Na Kau A Hi'iaka. Interviewing Kaina in the dressing room of Mamiya Theater, her 11-month-old son in her lap, one can’t help but feel a little bit of Hiʻiaka’s spirit in her. A profound sense of responsibility to her people and to their future. Show Information: There will be both evening performances and school day performances of Nā Kau A Hiʻiaka. Evening performances will be presented Aug 18th & 19th at 7:30pm and Aug 20th at 4pm at the Mamiya Theatre. Ticketing: Tickets are available at a cost of $10 to $20. Advanced tickets using a credit card may be done through www.showtix4u.com (keyword Chaminade or Honolulu) or by calling 1-866-967-8167. For more information call 808-202-6360. The inaugural production of the new Hawaiian Theatre program at UH Mānoa sold out its first weekend at Kennedy Theatre. HPR’s Noe Tanigawa reports Lāʻieikawai is the story of how the most beautiful woman in Hawai‘i found her true love. A special fund for Hawaiian Theatre has been started at the UH Foundation for touring and for future productions. 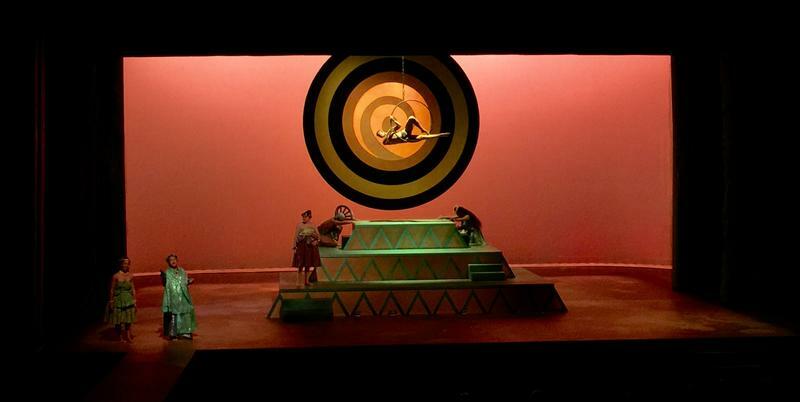 “Lāʻieikawai” continues at Kennedy Theatre on the UH Mānoa campus through this weekend only.